I just spent a couple days trying to build Spidermonkey on Windows with Narcissus, JS_THREADSAFE and JS_HAS_FILE_OBJECT support in order to parse and do some static analysis of malicious JS. After patching the the Makefiles (and cpp in one place) and trying way too hard to make it work, I’ve got to warn others off of going down this route. I repeat: DON’T try to make it work. First, you’ll find that there’s no easily available parsing API in spidermonkey itself and that building in extensions is incredibly tedious and error prone (despite the great autoconfig work done in 1.8.1 for the vanilla build, which works perfectly); second, the non-standard File object is no longer maintained and as of Feb 10, 2010 is completely removed. So with that option DOA, if you had your heart set on using Narcissus for parsing, it can be trivially ported to Rhino. Despite Brendan’s comments in the Narc code and other locations on the web that it relies on several Spidermonkey-specific extensions, it runs perfectly fine (at least the parser does) with a few minor changes. Here is the code, a diff, and sample tree walker. If you’re just tuning in, this is the second post in a series. 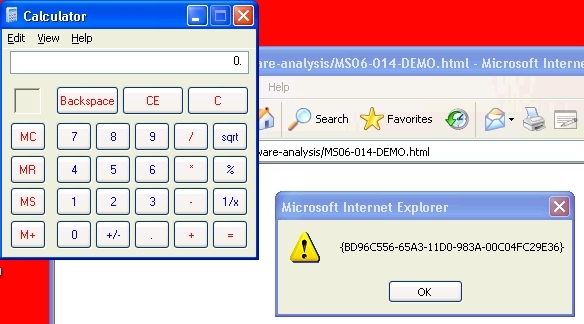 Check out the beginning of the Malware Analysis Walking Tour to see how we got here. Everything up to this point has just been a wrapper around the actual exploit; boilerplate or necessary paperwork if you will. Now it’s time to look at what code actually got the machine to do something it wasn’t supposed to do, that is, what caused the SgwAg.exe to get written to disk and ultimately executed. Again, I start with a topical readthrough to get an idea of what’s significant and the general flow (full decoded exploit routine in Appendix 2). I see that the exploit code consists of a series of function definitions followed by a single statement: a call to mudac(). The mudac() function is actually a slightly modified form of one we’ve seen many times before; probably copy and pasted code from some malware forum or a published exploit. The function simply tries to instantiate a list of known-vulnerable CLSIDs (ActiveX controls) and stops at the first one that gives it shell access. If all those fail, it falls through to the creatively named Func4, FuncPD, and FuncKJ to try some Acrobat and Java applet exploits. Most of these have all been well analyzed and reported on. The only one that didn’t have a clear story was 6414512B-B978-451D-A0D8-FCFDF33E833C. It’s worth revisiting once we’ve finished analyzing what happens after one of these is instantiated. We still don’t know which control actually owns the machine. The mudac function is a pretty standard example of the drive-by malware approach of “throw a bunch of crap at the browser and see if something works” (You can actually see that the same GUIDS appear multiple times in the objects array; clearly some copy-paste-kitchen-sink coding going on here). We’ll put this issue on the back burner for now; it’s enough to know that one of them worked. At this point I read CreateO() and Go() to see what the code is doing after it finds an ActiveX control it can instantiate. The first thing I notice is that the name of the exe that gets created (SgwAg.exe) doesn’t show up anywhere. I suspect that the “filename” var in Go() might be randomly generated by the server. Lets see what happens if we get the page again. Ah! Lots of different variable names, same structure. Is the Modified Date at least constant? Nope. So, it looks like there’s a real script on the other end that’s re-doing the obfuscation on each request. Cheeky bastards. No bother, we can confirm by going back to the original content that the Malware Scanner picked up and verifying that (when decoded) the filename that gets written is indeed the one supplied in Go(). Copying the page from the Scanner report into index.html.from_scanner and stripping any of the HTML/DOM cruft, then changing eval() to print() lets us run the code outside of a browser. The only other change we need to make is to short circuit the lastModified check. Since we know the first character in the resulting plaintext is “f”, it’s easy to work back to the decoding key (in this case it’s 118 – ‘f’ = 16). $ js index.html.from_scanner | grep "var filename"
Good, we’re back on solid ground. So, we know the nature of the obfuscation and the exploit, and have isolated the payload. Next up is payload analysis, but for a number of reasons we like to have samples of each exploit vector that we find in the wild. 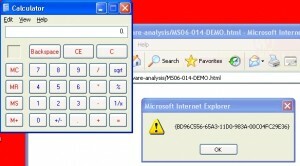 So, I cook up a version of this exploit that downloads a demo payload; I like calc.exe. It’s a simple matter of finding the part of the obfuscated script element that corresponds to the evil payload url and replacing it with the url of something more benign. While I’m at it, I add an alert() to print which ActiveX control actually causes the payload to be downloaded and run (remember that it tries several) and also remove the couple of other Java and Acrobat exploits. Copy it over to the test server, fire up an unpatched IE and…Bingo. This would be enough to call it a day if we were only interested in the exploit vector; it’s a well known exploit vector and now we’ve got a nice sample in case we ever need to reproduce it. However, we could still take a look at the payload it brought down.